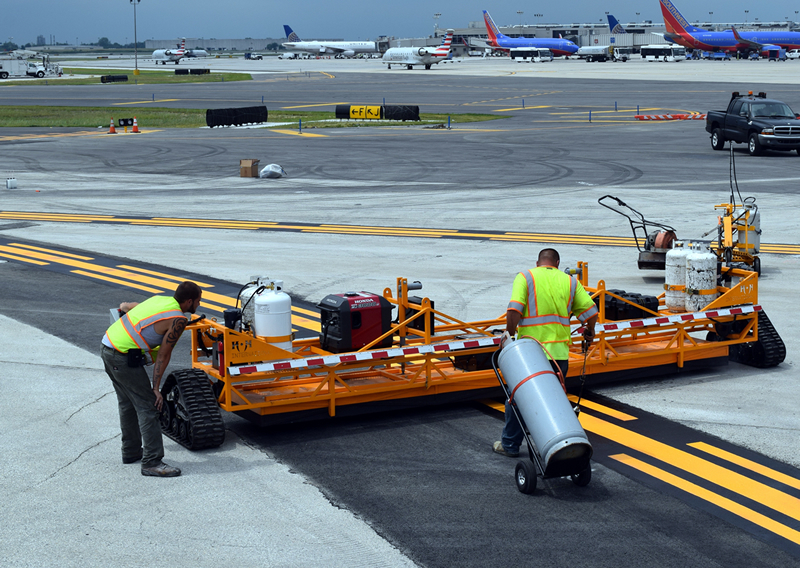 Zone Striping, Inc. recently installed the first “Air Mark®” preformed thermoplastic taxiway pavement marking material ever to be utilized on a Philadelphia International Airport project. “Air Mark®” is a highly durable extended life preformed thermoplastic product manufactured by Ennis-Flint for the demarcation of Runway Hold Position Boxes, Enhanced Centerlines and Enhanced Hold Lines that are required as a result of new FAA striping requirements. The installation of “Air Mark®” involves extensive layout and material placement in order to comply with the FAA’s strict standards. After the placement of the material has been established and outlined, the area to be marked is covered with a 2-part primer/sealer. The “Air Mark®” material is then repositioned and heated with large walk behind and self-propelled infrared heaters in order to uniformly melt the material into the surface and activate the primer/sealer. The edges are also heated with hand held torches to ensure a water tight bond to the pavement surface. When properly installed this material outperforms all other products currently in use for Hold Position Boxes and Enhanced Markings. Zone Striping, Inc. is proud to be one of a select few manufacturer certified and licensed installers of “Air Mark®”. In addition to the 20,550 square feet of “Air Mark®” preformed thermoplastic markings, the contract also required nearly 12,000 square feet of temporary runway/taxiway painting and over 25,000 square feet of marking removal to accommodate the various phasing required as part of the overall project. The final paint striping requires over 65,000 square feet of runway/taxiway painting of taxiway centerline and edgeline markings as well as various other markings. Zone Striping, Inc. would like to thank our customer, General Contractor, Tony DePaul & Son for the opportunity to work on this project.